Time to play make believe! First… donuts sandwiched in between quinoa and beans makes donuts a reasonable meal. No, not literally. That would be weird. And do you think I’m weird? But like… technologically. If you eat quinoa on Monday and beans on Wednesday, donuts are totally acceptable – wait no… ENCOURAGED – on Tuesday. It’s a life law or something. Second… props to all these women in the crazy, crowded airports who are physically holding the PRINT version of 50 Shades of Grey in their hands, because unless it was my make-believe world, I wouldn’t have the guts. Even though I exploit my sad little life all over the internets. So there’s that. But I am still your terribly cliched whiney, needy chick who wouldn’t want to be judge by complete strangers. Trust this. Help me. Third… when I ate these burgers… I definitely pretended like the avocado cream was made with Greek yogurt. Which it wasn’t. At all. I made it with thick and creamy full-fat sour cream, and ate it in amounts that would only be appropriate if it was plain yogurt. I’m loving being in my own dreamland right now. 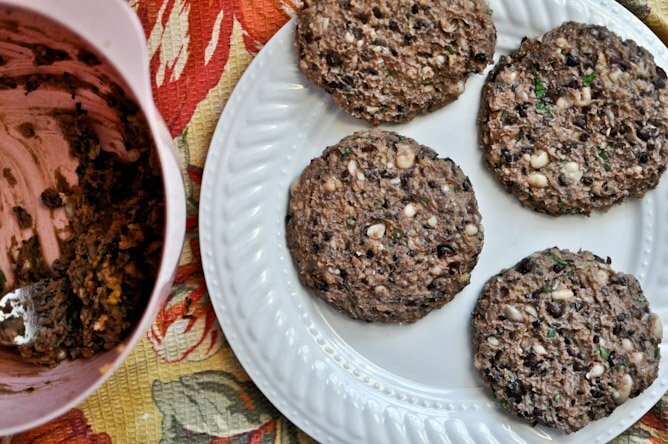 Most people make bean burgers because they are trying to eat less meat, or in fact – they don’t eat meat at all. Not me. I make bean burgers because I am 100% super freaking in lust with beans. Torrid, serious love affair. I almost made beef burgers and added beans straight inside. It’s happening next, just you wait. Okay so, the burgers are really incredible. 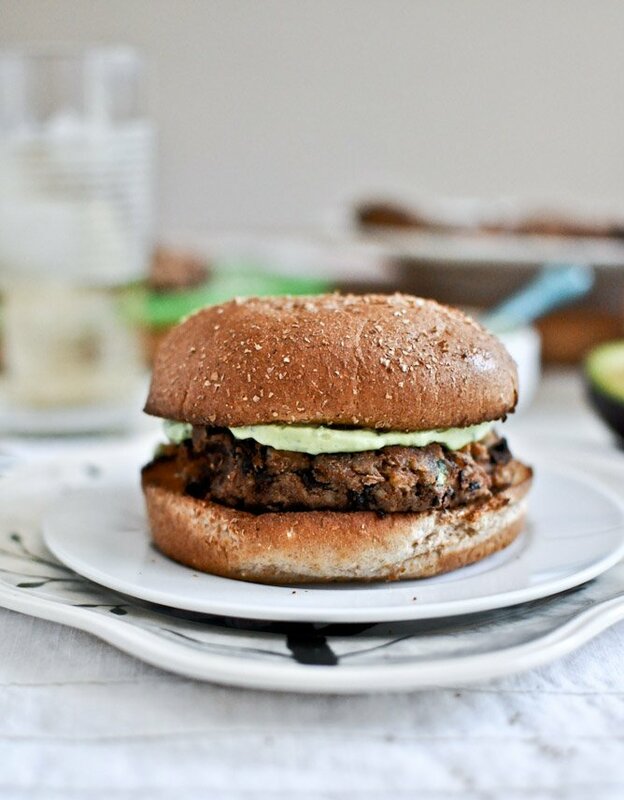 I enjoy them more that those BBQ chickpeas burgers I made a few months ago, and they are packed with enough flavor that I’d MAYBE consider eating them without the bun. Maybe. Maybe not. But the real winner here? It’s the avocado basil cream. I want to slather this on everything humanly possible. And as soon as I get home, I’m going to. Just tryyyy and stop me. In a large bowl, mash beans with a potato masher or fork. Add in cilantro, garlic, paprika, onion powder, salt and pepper, mixing to combine. In a smaller bowl, lightly beat eggs and add in 1 tablespoon olive oil and panko, stirring to mix. Add the egg mixture to the beans, and mix thoroughly to combine, bringing it together with your hands if needed. Separate the beans into 6 equal sections and form patties. Heat a large skillet over medium-high heat and add 1 tablespoon olive oil (or as much as you need). Add burgers and cook on each side until golden, about 5 minutes. Remove and serve with avocado cream on whole wheat buns! Add basil and avocado to a food processor, blending to combine. Once somewhat smooth, add in sour cream and blend again until combined. Add in salt and pepper, taste, and season more if desired. And now I feel so much better. Worthy of another donut. I am very much wishing to make these this weekend, but wanted to ask- would you know of any substitutions that could be used instead of egg? Thanks for this recipe. 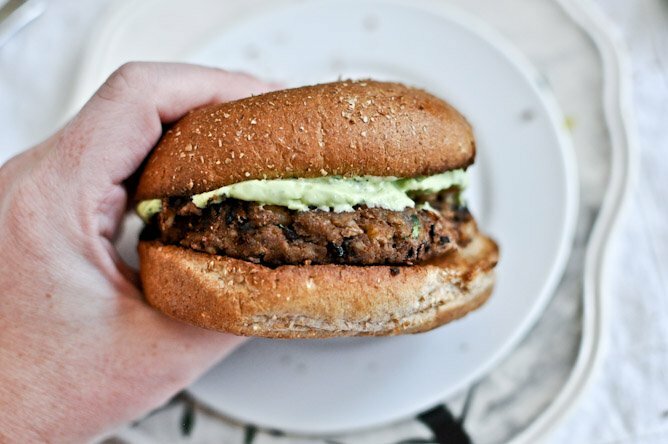 It’s my favorite black bean burger recipe and you weren’t kidding about the avocado sauce, I want to put it on everything! I admit I was skeptical of all those basil leaves being over powering. with the Avocado Basil Cream spread. But it turned out very well. It did need 4 sprinkles of pepper afterward though, to liven it up.. I’m not a bean or veggie burger fan, but I am an Avocado fan. I will test this on various sandwich combinations and hamburgers. I found it to be a little wet to work with. Did I goof something up? Taste good.